Julie Funke has been working with Fun with Financials since 2011. She has a true passion for using her strengths in finance, compliance and management to support the social justice movement. Julie works to help her clients think about the finances as a key tool to plan strategically and sustainably for their organizations. Julie began her career at Ernst & Young then moved to an architecture and design firm headquartered in Detroit. 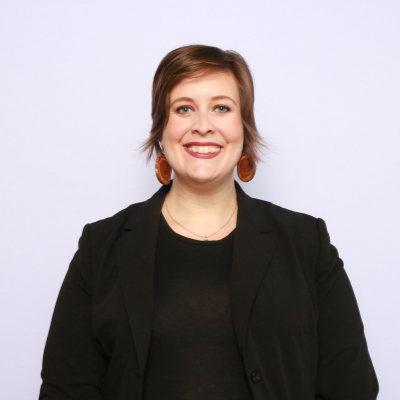 She shifted to work full-time in the nonprofit world in 2010 when she was hired as the Director of Finance & Administration at State Voices - a national nonprofit that provides tools and resources to support civic engagement across the country. Julie held that role until 2015, when she shifted to work with Fun with Financials full time. Julie holds a BA in Economics and a master’s degree in Accounting from the University of Michigan. She is also a Certified Public Accountant in the State of Michigan. She lives in Ferndale, Michigan with her husband Jay and their two feline friends, Barney & Elias. After work, you can find her on her yoga mat or harvesting from her urban garden.